Renovated four bedroom stone farmhouse, with outbuildings and fully enclosed walled gardens in great location. Renovated four bedroom stone farmhouse, with outbuildings and fully enclosed walled gardens . . . This town centre property has kitchen, bathroom, WC and larder on the ground floor. 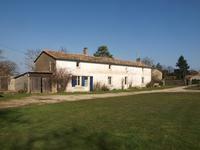 A . . .
Renovated 4 bedroom country property, already established as a successful B&B (Gîtes de France). Only 4km to a thriving market town. Great opportunity to buy an up and running business with an established client base. This . . .